This article was written By Azalia Muchransyah on 12 Apr 2019, and is filed under Reviews. Azalia Muchransyah is pursuing a Ph.D. in Media Study at University at Buffalo (SUNY). She is a recipient of 2017 DIKTI-Funded Fulbright Ph.D. Scholarship. Her area of interest is advocacy media, specifically AIDS Media in Indonesia. Prior to her Fulbright award, she was the Deputy Head of Film Program at Bina Nusantara University International, Jakarta, Indonesia. Her short films have been officially selected and screened in international festivals and academic conferences. They include Halal (2017), HIV/AIDS: Not A Death Sentence (2018), Big Durian Big Apple (2018), Blue Film (2018), and Tamu (2018). If you want to see a feel-good movie, Aruna and Her Palate is a good choice. Raising the themes of love, friendship, and food, this movie is packed with eye-pleasing cinematography and familiar urban protagonists. It’s the story of Aruna (Dian Sastrowardoyo) and her best friend Bono (Nicholas Saputra), who embark on a journey across four cities in Indonesia when Aruna is assigned to investigate cases of avian flu. Bono, a professional chef, thinks that it is a good idea for them to try out culinary delights in each of the cities they travel to – Surabaya, Pamekasan, Pontianak, and Singkawang. Bono also invites Nadezhda (Hannah Al Rasyid), his love interest who uses the trip as part of the research for her latest cookery book. Completing the formation is Farish (Oka Antara), Aruna’s co-worker who is assigned to accompany her during her avian flu investigation. As the story develops, we find out that this is not just another cheesy romantic drama where the characters have love-hate relations with each other and end up together, happily ever after. The dynamic between the four main characters also involves us as viewers, with Aruna secretly looking into the camera and communicating to us, both verbally and through her expressions. This is a playful way of showing Aruna’s inner voice instead of adding voice over, which is usually the case in films adapted from novels. Food also plays a big role in this film as its variety serves to move both the story and the characters forward. As Aruna mentions at the beginning of the film, she despises the way people think that good food only tastes good when we eat it with people that we love. Little does she knows, she has lost her palate’s ability to taste good food because she is missing that element of love in her life. A love, that later on, manifests in Farish, someone who is very different from her but completes her life perfectly, just like the perfect blend of spices in the foods that they cook and eat together as a couple. Obsessions with food and love are indeed the center of Aruna and Her Palate, with each of the four main characters holding their own ideal views on both. However, as road trip films usually do, the journey exposes them to new point of views that challenge their ideals and force them to change in order to get what they need in life, instead of what they want. One of the most interesting things about this film is the choice of Sastrowardoyo and Saputra as its leading characters. The two were forever ingrained in the Indonesian public’s mind when they played on screen sweethearts in the local box office hit Ada Apa Dengan Cinta? (2002), followed by its sequel Ada Apa Dengan Cinta? 2 (2016). 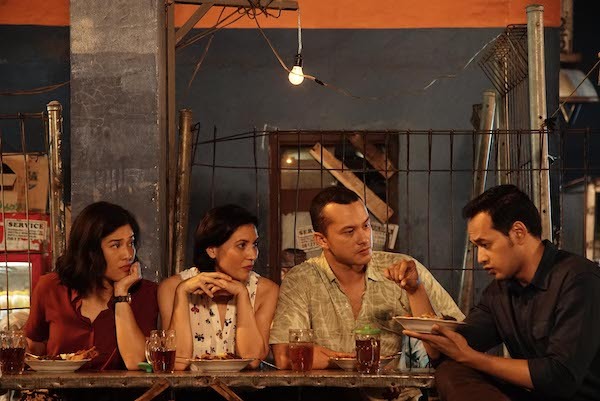 This is why seeing them as platonic best friends in Aruna and Her Palate can be quite stark for Indonesian film lovers and many might even secretly wish that they might end up being together at the end of this film. Directed by Edwin, an Indonesian director well-known for his experimental films such as Blind Pig Who Wants to Fly (2008) and Postcard from the Zoo (2012), this film was nominated and won several awards, including two 2018 Citra Awards for Best Supporting Actor (Nicholas Saputra) and Best Writing for Adapted Screenplay (Titien Wattimena). Aruna & Her Palate is on April 12 and 15 at the San Diego Asian Film Festival Spring Showcase.